March 21, 2019 -- Heights High junior Rohan Bruce has “always really liked reading, and I retain a lot of (seemingly) useless information,” a skill she puts to good use as captain of the high school’s Academic Challenge team. Academic Challenge is a quiz show for high school students, testing their knowledge of a wide range of topics from literature and history to physics and geography. A fledgling club was started at the middle school level a few years ago, which is where now sophomores Maple Buescher and Leo Kenealy got their start. Maple hoped to continue competing in high school and proposed a club to some of the building administrators, who approved the idea as long as she could find an advisor. Social studies teacher Karl Neitzel stepped up to the challenge, so to speak. Open to any student who wants to participate, the club runs its own mini-tournaments, attends Quiz Bowls such as the ones hosted by Solon and Brush high schools, and studies a lot of trivia. “Each student has their own areas of expertise,” said Mr. Neitzel. “One might know everything about history while another reads all the time.” The quiz structure includes both team rounds, where students have the time to confer with one another and lightning rounds, where they have to buzz in as quickly as possible. The ultimate goal of the team was to compete on the weekly televised Academic Challenge program on WEWS, Channel 5. 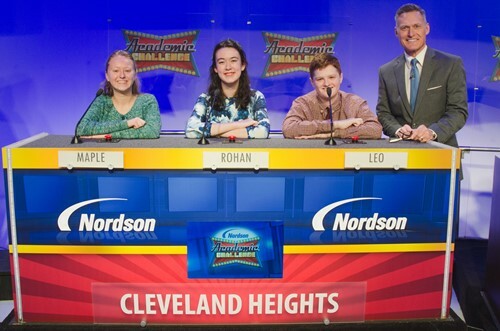 Which is exactly what the Heights High team will do on Saturday, March 23 at 10 a.m. Three Heights High students, Rohan, Leo, and Maple, will go head to head against students from St. Ignatius and North Ridgeville high schools. Alternates Sam Hermes and Ethan Zoldak, both seniors, also attended the taping of the show, which happened some weeks ago. The entire Tiger Nation community is strongly encouraged to tune in on Saturday, March 23 at 10 a.m. to cheer on our students as they prove that all that information they’ve retained isn’t so useless after all.